Samantha Payne and Joel Gibbard form Open Bionics, an organisation that want to change the way bionic limbs are currently manufactured in order to make them more accessible to amputees. By using an innovative technique of 3D printing, Open Bionics scan the residual limb, print a socket to create the perfect fit and then continue to print the remainder of the bionic limb. This technique aims to reduce the cost of purchasing a bionic arm for example, from between £30,000-£80,000 to less than £4,000. Not only will the lower cost make bionic limbs more readily accessible, the team also share their development findings with the open source community. They have a firm belief that sharing their own experience enables others to use their designs as long as they provide feedback that they can develop from. Open Bionics have set out to revolutionise the field of robotic prosthetics, creating affordable, accessible, unique limbs for everyone. They are only two years in and still at the research stage but they are already in the top 50 robotics companies in the world. The Open Bionics team is fronted by Joel Gibbard and Samantha Payne. We recently met up with Samantha who gave us an insight into this young exciting company. Samantha was working as a freelance journalist for a local newspaper in her home town of Bristol when she first met Joel. She recalls, “Joel had just finished a very successful crowd funding campaign called the ‘Open Hand Project’ to produce a low cost 3D printed bionic hand. She was assigned to the story. After the successful crowd funding campaign Joel quit his job to make open-source hands for amputees. Shortly after that he discovered a competition run by Intel which was looking for the best wearable tech project. The winner would receive $500,000. He quickly got back in touch with Samantha asking for her help with the all-important pitch. There were more than 500 applicants and this was soon trimmed down to 30. The 30 entrants were given the opportunity to enter a three-month intense programme/competition in the USA. Samantha quit her job and the two of them set up Open Bionics and travelled to the States with the hope of winning the money. After three months, the numbers were cut from 30 to 10. The pair made it through to the end of the process but were pipped at the post, securing second place and a prize worth $250,000 which was enough to set up the business. During the three months in the States, the intense programme gave them the skills and knowledge of how to set up, market and drive a start-up company. They used the money to hire a main core engineering team and set up their lab in 2015. We later met Dan in the Open Bionics studio. He said, “I was born with only one full arm and never truly got on with the traditional prosthetic. When I came across the Open Hand Project on Kickstarter, I saw the title ‘3D Printed, low cost, bionic arm.’ I was intrigued.” Dan quickly got in touch with Joel to offer his help on the testing front and within months he was in the studio testing the first prototype. 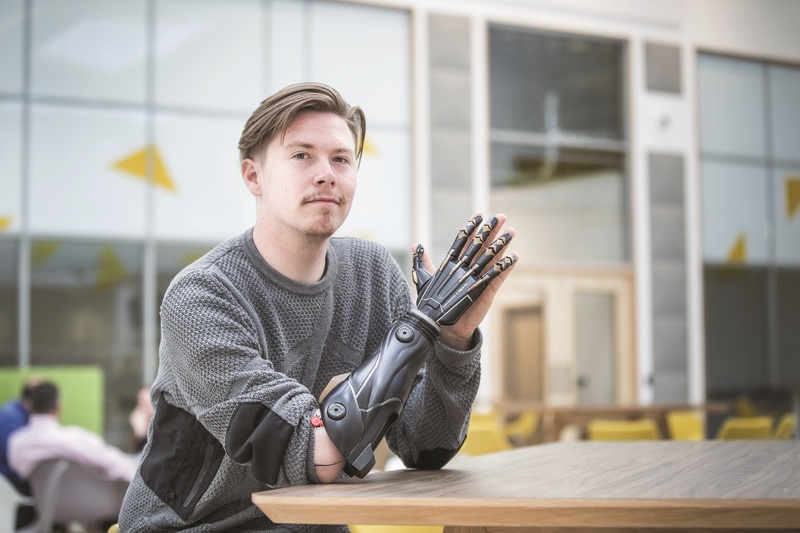 “I’d brought my brother along and once the hand was fitted I was able to shake his hand, which was pretty emotional.” Two years on, Dan is still one of the main testers at Open Bionics and travels to lots of global events to promote the business. He said, “I think what the team are doing is amazing. I’m so excited about the future of prosthetics and feel so privileged to play a small part in bringing these particular bionic limbs to reality.” He talked us through a number of movements the bionic arm he was testing could do… open and close to pick up a mug of coffee or bottle, grip to pick up small things like screws and a bunch of keys and a half hand to pick up carrier bags, as well as a finger point and thumbs up to be able to gesture. The process Open Bionics use to produce the current robotic limbs is quite unique. They use a 3D scanner to scan the residual limb and then use a 3D printer to produce the socket for a perfect fit. The 3D printer then continues to make the rest of the robotic limb. It’s this printing technique that enables the customisation that previously wasn’t available. Amputees can currently pay anything from £30,000-£80,000 for a bionic arm, but Open Bionics want to create limbs that will cost less than £4,000. The focus now is to create a lightweight limb with a comfortable socket that will ideally have some form of temperature control, can perform multi-grip functions and importantly, look great. The latest one in development is based on a fictional character called Adam Jenson from the game Deus Ex. Next up is the Disney line and then the Marvel Superheroes line, making prosthetics appealing for kids. Samantha told us that they want to work on something specific for upper arm amputees and then exoskeletons to give people movement who may have suffered a stroke or have some other debilitating condition which restricts movement. From an early stage Open Bionics have been truly transparent in their development, sharing lots of findings with the open source community. They set up the Ada hand project, a platform for research into prosthetics, object grasping and many human-robot-interaction applications. “Our open source licence aims to build a community to allow people to use our designs as long as they feed back on the results and share any developments they have made.” This allows Open Bionics to harness expertise to develop and advance the current offering, creating a cycle where hopefully the designs and manufacture will keep on improving and benefit everyone. The Ada hands have a global reach and can be found in many countries across the world. Sam informed us that they have never taken out an advertisement or spent any money on marketing so they are constantly amazed when new orders arrive. The team have received global acclaim, won numerous awards and continue to push the boundaries with innovative technology. 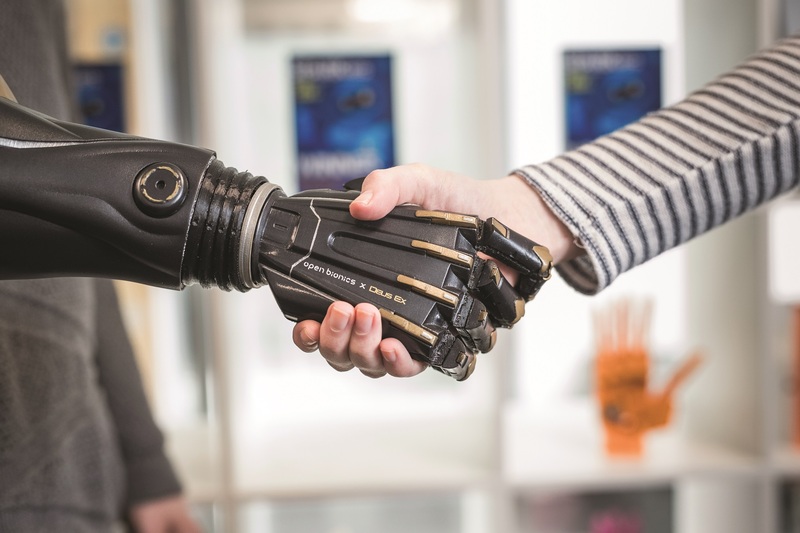 In the past, the manufacture of bionic hands has been generic and out of touch with individual requirements, but Open Bionics have changed that by initiating debate with amputees with the idea of developing a product aimed at comfort and affordability. “What we do is really rewarding, every development we make feels like a real leap forward and when we test the devices the reactions we get from the amputees and their families are priceless.” Sam and Joel are clearly focused individuals who are committed to driving this young exciting team forward and helping to change the future of robotic limbs for good. This entry was posted in General, Innovation and tagged 3D Printing, Affordable Healthcare, Healthcare Heroes, Open Bionics, Prosthetic, Robotics, Technology Start-up, The Passion Project on February 14, 2017 by David Hunt.